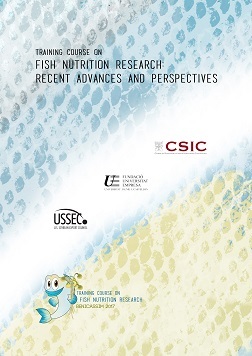 The present volume collects the contributions of lecturers at the Training Course on Fish Nutrition Research: Recent Advances and Perspectives, organized by the Nutrigenomics and Fish Growth Endocrinology Group of Institute of Aquaculture Torre de la Sal (IATS-CSIC). The Course was sponsored by USSEC and directed to R+D personnel of the aquaculture sector working in fish nutrition and health. From June 13-15 2017, conferences were held at Hotel Voramar in Benicàssim by researchers of IATS-CSIC (Nutrigenomics and Fish Pathology Groups), INRA (Drs. S. Kaushik and G. Corraze), ULPGC (Profs. M. Izquierdo and J. Afonso) and Sparos Lda (Dr. L. Conceição). Topics covered a wide range of nutrition-mediated issues: larval nutritional programming, nutrient x genotype interactions, resistance to bacterial and parasite infections, food safety, and long-term consequences of low fish meal/fish oil diets in fish species of interest in aquaculture (rainbow trout, European sea bass, gilthead sea bream). Main results and conclusions are from the ARRAINA EU Project. Current research on ongoing H2020 Projects (ParaFishControl , AQUAEXCEL2020) is also presented. The Course was completed with a visit to IATS-CSIC facilities on June 16. This book was added to our online catalog on Monday 30 April, 2018.